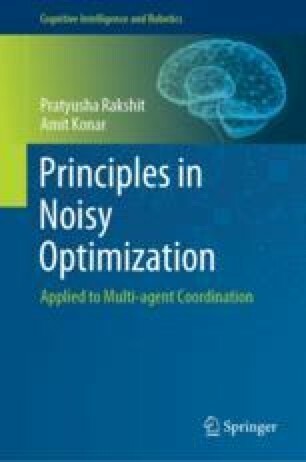 The chapter proposes an extension of multi-objective optimization realized with differential evolution algorithm to handle the effect of noise in objective functions. The proposed extension offers four merits with respect to its traditional counterpart by the following counts. First, an adaptive selection of sample size of objective functions (based on their variance in the neighborhood) avoids unnecessary re-evaluation for quality solutions without avoiding the necessary evaluation for the relatively poor solutions. Second, introduction of a probabilistic dominance scheme (in contrast to traditional deterministic selection) to measure the qualitative dominance of one solution with respect to the other reduces the possibility of promotion of inferior solutions into the Pareto front. Third, the solutions lying in the neighborhood of the apparent Pareto front are clustered with an aim to nullify the detrimental effect of noise on the rejection of the non-dominated solutions from the Pareto-optimal front. Finally, to determine the diversity of solutions in the noisy objective space, the crowding distance metric is modified using the probability of a solution having been dominated by others. Computer simulations performed on noisy version of a well-known set of 23 benchmark functions reveal that the proposed algorithm outperforms its competitors with respect to inverted generational distance, spacing, and error ratio. Experiments undertaken on a multi-objective formulation of a multi-robot cooperative box-pushing problem indicate that the proposed algorithm outperforms other multi-objective optimization techniques used for the same application with respect to three standard metrics defined in the literature.